"He's looking for a few good men... or a few guys old enough to shave." Major Payne considers himself a tough-guy or a solider which to be reckoned. He is floored when he is not considered for a promotion in the service. He is subsequently told that it is his time to go. He pleads with his Commander: surely there must be another military campaign somewhere else. The commanding officer simply tells Payne that there are no campaigns; and he (Payne) has done enough. We next see Payne back in the civilian lifestyle. Here he is naturally unemployed at first. He attempts to become part of the police force; however, his luck runs thin when he becomes too obsessed with a training simulation. He literally goes to town attacking another person playing the role of the bad guy. After his unsuccessful try for the police, an old acquaintance places him in a position as Officer in Charge of a junior ROTC training academy. The school is a private academy located in Virginia. This again is not the best job for Payne. 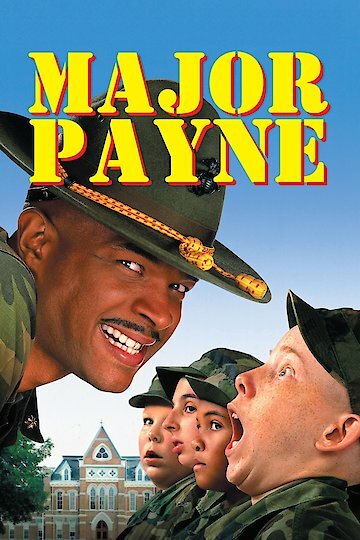 Major Payne is currently available to watch and stream, download, buy on demand at Amazon Prime, Amazon, Vudu, FandangoNow, iTunes, YouTube VOD online.